When shopping for a camera bag, it’s important to give some thought to how you’ll use it. Just as you don’t need a $5,000 Nikon DSLR to take good pictures of your nephew’s birthday party, neither do you need a $400 rolling camera suitcase if you’re just traveling short distances and not carrying a pile of gear. When you’re traveling to Africa, Europe, or the Far East and want to be prepared for every possible shooting situation, you really appreciate dedicated pro luggage like ThinkTank Photo’s Airport International LE Classic. It’s as durable and functional as any rolling camera pack I’ve seen. It also happens to be attractive. ThinkTank says this rolling camera bag will hold a 500mm f/4 lens unattached, additional smaller lenses, and up to two gripped DSLR camera bodies. 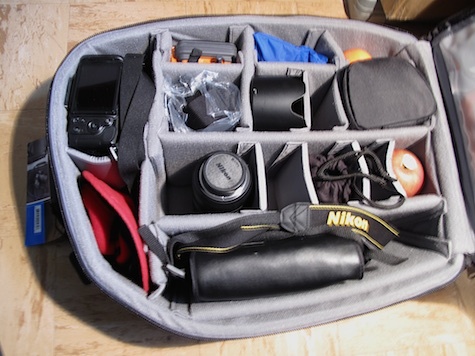 It will easily accommodate multiple professional lenses, flashes, and other accessories. 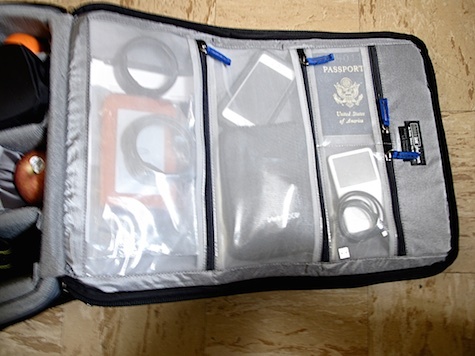 There’s also a pouch and strap that enable you to connect a telescoping tripod to the side, and a separate zippered “office” compartment for SD cards, pens, and miscellaneous objects. There are a lot of competing bags that will carry loads of gear, but finding one built with the heft and refinements of Airport International LE Classic would be a challenge. 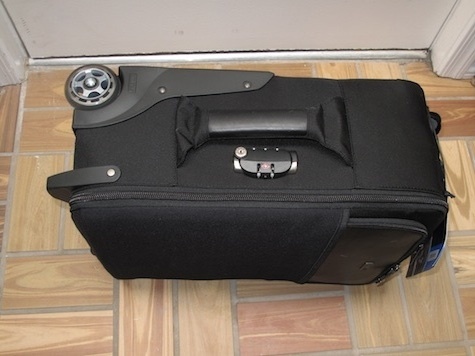 This rolling pack comes with two locks: a TSA approved combination for the main compartment and a cable that enables you to lock the bag to any fixed object. I can’t imagine ever doing this with a pack loaded with thousands of dollars of camera gear, but you never know when such a situation will occur. Another detail I liked is the inclusion of three handles: two thick padded ones on the top and side and one unpadded grip on the bottom. I don’t own enough camera equipment to fill the LE Classic, but I appreciated having the room for a variety of other stuff I like to haul around — a jacket, hat, eyeglass case, a book, magazines, binoculars, plus lunch or a snack sealed in a plastic container. The LE Classic (or Limited Edition Classic) will roll easily through a plane’s narrow aisle and fit in most overhead compartments. If there is any drawback to the pack it’s the absence of a dedicated padded compartment for a tablet or laptop computer. There is a compartment on the front that will fit a laptop, but it is not padded and does not lock. For superior water-resistance, all exterior fabric has a durable water-repellent (DWR) coating, plus the underside of the fabric has a polyurethane coating. It also has smooth, durable full-grain leather, 1680D ballistic nylon, YKK® RC Fuse (abrasion-resistant) zippers, custom designed extra tall skid plates, replaceable in-line skate style wheels, antique nickel-plated metal hardware, SpanKodra front pocket, nylon webbing, and 3-ply bonded nylon thread. ThinkTank Photo is not the only player in this world of rolling camera bags, but it has a well-earned reputation for quality construction and attention to detail. The Airport International LE Classic is enthusiastically recommended.